Two of my favorite things in craft beer are sour ales and hoppy brews, so when I saw this “dry-hopped sour ale” I was on cloud nine! 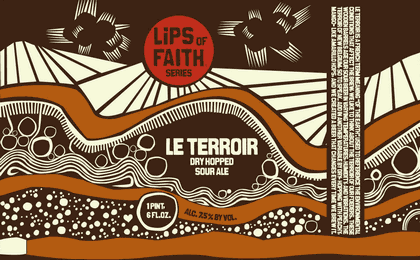 I always get excited about new Lips of Faith beers, but this one really had me pumped. Enough rambling, onto the review. LE TERROIR is an American Wild Ale with a 7.5% ABV. Here’s another review that I’ve been inadvertently sitting on for the past (almost) year. 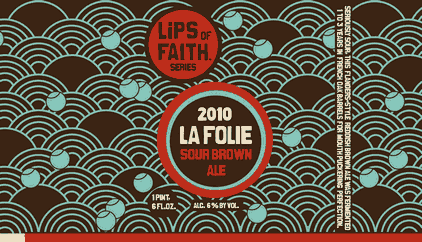 LA FOLIE 2010 is part of New Belgium’s Lips of Faith series of special release ales. Its predecessor, La Folie 2009, was my favorite beer of 2010, so needless to say, I had high hopes for this one. La Folie is a Flanders Red Ale with a 6% ABV. As the weather is starting to cool down outside, my summer seasonal week is also coming to an end. For this last day I decided to go with the beer that I had the most this year: SOMERSAULT from New Belgium Brewing Company. Somersault is a blonde ale with a 5.2% ABV, 28 IBUs and 130 calories. Another trip to the Midwest, another Southern Tier beer review. I was back recently for a wedding and noticed a bottle of ÜBERSUN in a beer store and knew I had to buy it. I couldn’t find any info about this beer on the Southern Tier website, thankfully I took a picture of the bottle. ÜberSun is an (Imperial) Wheat Beer with an 8% ABV. I recently went and saw John Williams perform live with the Los Angeles Philharmonic at the Hollywood Bowl and I brought a six pack of this beer to keep me company. I knew nothing about it, but I saw that it was a summer seasonal and what better type of beer to keep you cool on a warm August night while enjoying live music under the stars. Summer Love is a blonde ale available May through the summer. It clocks in at an easy drinking 5.2% ABV. I am a huge fan of lemonade, so obviously the shandy beer style is right up my alley (beer +lemonade = awesome). Today’s beer is Leinenkugel’s variation on the style in the form of their summer seasonal. Summer Shandy has an easy-drinking 4.2% ABV, a mere 130 calories per bottle and is available April-August.